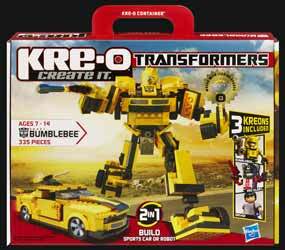 Hasbro's Kre-o range of construction kits are the company's answer to Lego (there, I've mentioned the "L" word) - even the name is similar. To be honest I'm surprised that it's taken a giant like Hasbro so long to step into the arena, however the results are well worth the wait and I've got to admit that I found this Kre-o set to be better than most Lego kits. 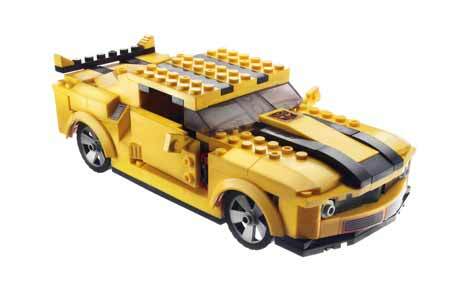 This Bumblebee set contains 335 pieces which allow you to build either the car or the robot (there's great pains on the box to point out that this doesn't actually transform itself) You also get three Kreon figures (Bumblebee, Red Alert and Driver) which can fit inside the car. 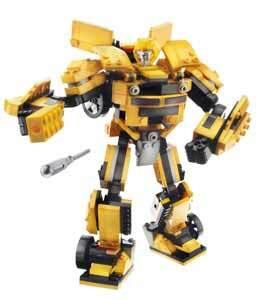 As with all Kre-o sets this can be added to other sets to build other models from your own imagination. What is disappointing, but this is the same for just about everything in the UK at the moment, is that the RRP for this in America is $27.99 (which translates to around £18) yet UK consumers are being asked to pay £30. Even with that in mind, this is still excellent value for money and will keep children amused for hours.